Suffering from allergies and want to relieve your symptoms? Get this Whirlpool Whispure 315-CADR Air Purifier. This unit features a three-stage filtration system, including a pre-filter, carbon filter, and a true HEPA filter. The air purifier’s outside grill which acts as a pre-filter is designed to capture large particles and prevent them from entering the unit. The carbon filter is responsible for catching large particles that find their way inside the unit, eliminating odors and protecting the HEPA filter. The HEPA filter then removes up to 99.97% of particles that are 0.3 microns and larger, such as pet dander, dust mites, pollen, ragweed, mold spores, keeping you far away from allergies. Don’t be fooled by the small size of the machine, it features a great ability to clean a large area. This Whirlpool Whispure 315-CADR Air Purifier filters the air about 5 times per hour in a room up to an estimated size of 500 square feet. Additionally, this unit is ENERGY STAR Qualified, making it a great investment. Ideal for filtering the air in large rooms up to 500 square feet. True HEPA filter is capable of capturing 99.97% of microscopic particles as small as 0.3 microns. Filters the air 4.8 times per hour. 4 fan speeds, plus sleep and turbo modes. Quiet and easy to use electronic controls. It works very well, definitely can tell the difference in the indoor air quality. Quite easy to replace both carbon pre-filter and HEPA filter. 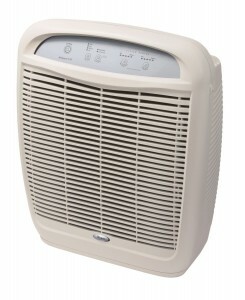 Extremely quiet on its lowest setting and moves a great amount of air on its highest setting. Helpful filter change indicator lights. The highest setting is a little bit noisy. It is quite large for some people. The HEPA filter is expensive.